Do you really need to use the META Description? Its a question that I was asked the other day during a training session. The company involved were redesigning their website and the developers they used said that META tags were not necessary any more and they singled out the Description tag. The argument was that content and semantic markup was more important. Content is vitally important, semantic markup and microdata are both reasonably advanced areas of SEO and are becoming more important but the META Description tag is absolutely vital! Always use them on every page and here’s why. The idea of the description tag is for you to describe what your page is about and Google, Bing and other search engines may use all or some of the description when creating the snippet of text underneath your search listing. Its important to make sure your description tag is well written, highly descriptive and also exciting. Parts or all of your description could appear in front of searchers eyes so it needs to attract attention in a non-neon, non-shouty way! Another important reason for using a well written Description Tag is that it can appear on Social Media sites. When one of your visitors, or you, share one of your web pages on Twitter, Facebook, Google+ and other social networks the Description Tag is sent along with the share and it appears in the listing on that social media site. Again the description is put in front of peoples eyes so it must be attractive and good enough to help generate clicks. Make it exciting and very descriptive. If Google shows it all in one go they tend to truncate it with … after around 160 characters so if your really interesting fact is at the end it may not appear. Slip in a couple of words like new, improved, original, now, natural, powerful… these words can make your description a little more exciting and encourage clicks. Don’t go made though, 2 or 3 max. Don’t go waffling on about all kinds of features and talking about your brand or company. Just talk specifically about the content of the page. This will help all the search engines understand exactly what your page is about. The whole idea of the description tag is to describe the page so make sure you really describe it. Use 2 or 3 key phrases (not words) so that you can improve the chances of your page appearing for more searches. Research your key phrases to make sure they are actually being searched for. The description tag is really important and can be used by the search engines to find out what your page is about. Well written descriptions will attract user clicks and hopefully generate a few new leads and sales. And finally…… If I see cool or interesting things when I’m out and about training I take photo’s so here’s one of St Pancras station in London. 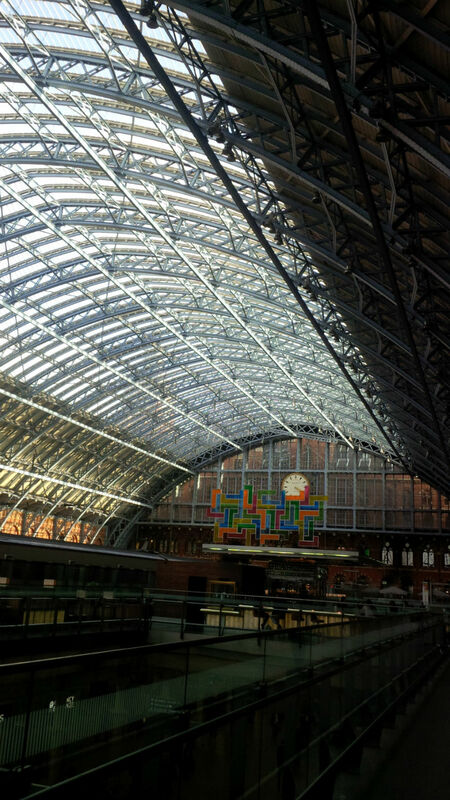 Its the first time I’ve been through St Pancras and its very cool.